This is another post that seems to require a slightly different format. Finally being footloose and fancy-free, we took the opportunity to run away from both the British Xmas and the British winter by trying an extended trip to Spain. Previously, we have really only escaped Xmas and the New year. This time, we arrived in Jalón on 21st December, 2017. Our planned departure date is 11th March, 2018, so it will have been a 3-month trip all bar the shouting. 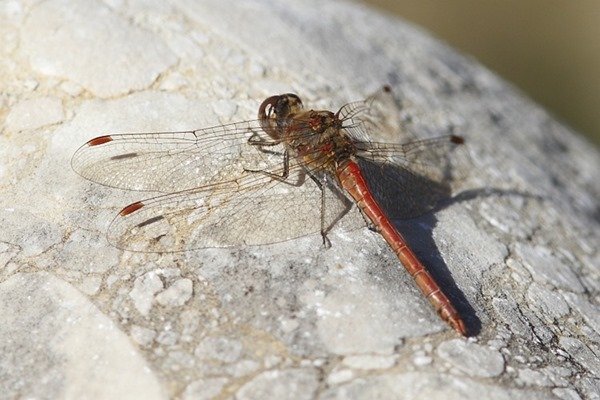 Unsurprisingly, my late season encounters have always been with Common Darters (Sympetrum striolatum). S. striolatum is the latest flying species in the UK where it can been seen into November, even into December if milder conditions permit. In 2017, the latest UK record seems to have been 28th November in Hampshire, again unsurprisingly. I have seen dragonflies in Spain’s winter on earlier trips, initially when we were still in our house-sitting-for-friends phase. That was in December. On a later brief visit, I spotted a couple just into January. Those sightings, I’ve included for the sake of completeness. Now I would be here longer, my intrigue was now with just how late they might be around, particularly since the Jalón 2017-18 winter was enjoying very clement weather. 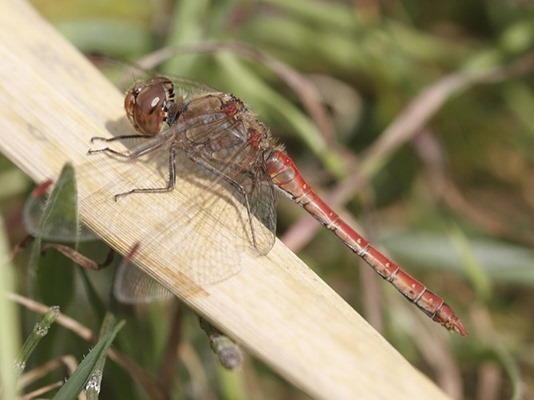 So, the reason for a different format report is that only a single species, Sympetrum striolatum, is involved. This was my first late season encounter. I wrote it up in Odo-natter, Spain, Xmas 2013. 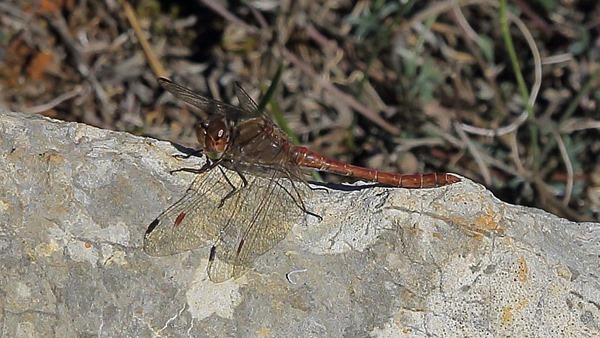 On a sunny day we looked over the wall at a part of the river bed (the river flows only occasionally) in Jalón [#1] and I was then surprised to see a red Darter basking on a poolside rock. There was even some ovipositing going on. I tagged them as Sympetrum striolatum. At the time it rated as the latest I’d ever seen a European odo. Another pleasantly warm winter’s day that would rate as a decent spring or summer day in England, and I found a couple of Common Darters at a nearby but slightly different point along the Jalón river [#1]. We’d pushed the boundary into early January. Friends on a Spanish Facebook odonata group were pretty sure S. striolatum was correct, however, so my confidence returned. 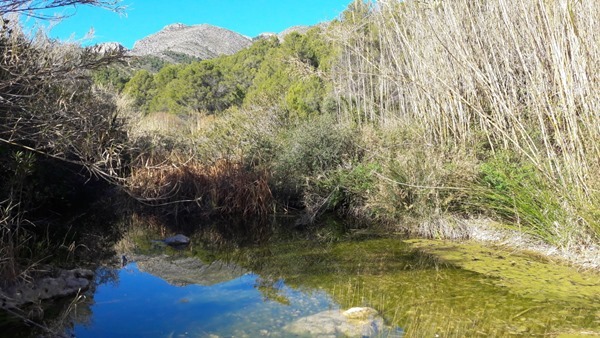 In continuing good weather and since I had been finding odos at Jalón at an altitude of 200m, I thought I’d try one of my favourite nearby locations, the Marjal de Pego-Oliva [#2], down at sea level. At first things looked quiet but soon a female Darter zoomed by us along the river, too fast to identify and with no chance of a picture. Conditions were quite windy. We saw nothing more until we got to a boardwalk which was more sheltered, winding its way through some bamboo plantations. 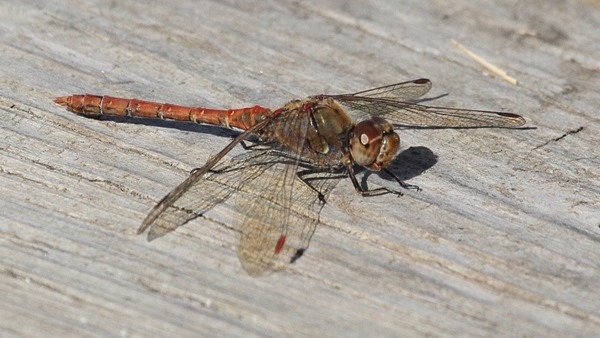 There, as Common Darters are fond of doing, were several individuals basking on the wooden boardwalk. We did see a tandem pair fly by, too. I studied the river in Jalón [#1] again, all three locations that had previously produced results. The first two produced nothing. The third did likewise until I had given up and was on my return loop, then I encountered a solo male Common Darter posing wonderfully in the strong sunshine. I’d beaten my latest date. We’d been doing a bit of more serious walking but on this day we were out for a more casual walk. I had no camera but Carol had hers, armed with a short lens, in search of almond blossom plantations. 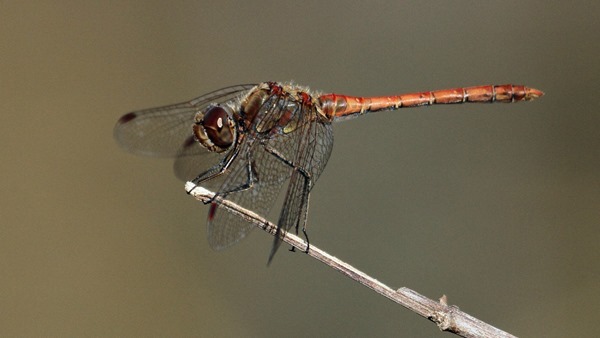 To my complete surprise, passing through a wooded, sheltered glade in Jalón [#3], at some distance from any water (that I knew about, that is), we spotted a lone male Common Darter flitting about. I borrowed Carol’s camera to record it. My season had gone out by a little over a week. Back on the river in Jalón [#1]. One of the pools is difficult to access but the difficulty makes it more sheltered. Here, we found three individuals, one of which was posing quite nicely, though the light was against me. I was a happy camper already but things improved. 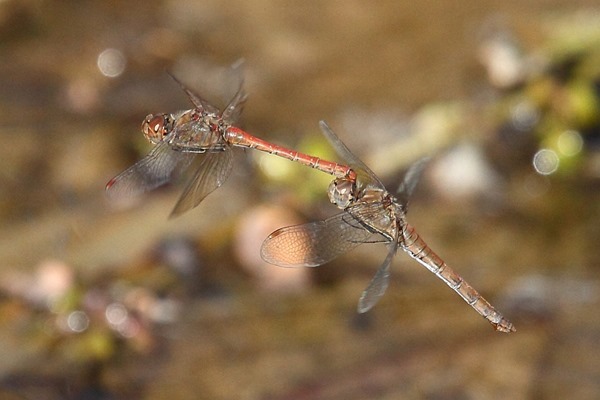 On our return, as we were passing a shallow ford, a pair of Common Darters again began ovipositing. Now I was on the correct side of the light, switched to manual, Captain Kirk, and got one decent shot out of a whole bunch of near misses. We were out on one of our more serious walks with the Costa Blanca Mountain Walkers group. We’d started in Tormos, a village in the neighbouring Vall de Laguar. Heading back down a zigzag stony track, I rounded a corner and startled a dragonfly. Shortly afterwards, we spotted the pool [#4] from which it had undoubtedly come and where a couple more were flying. Once again, we were not equipped for wildlife photography but a phone camera captured the habitat. Very nearly no dragonflies and definitely no picture. 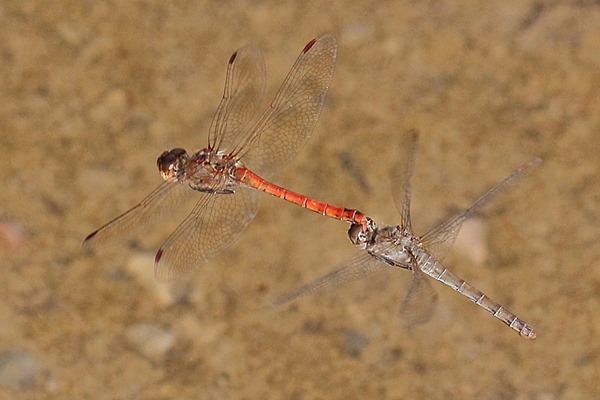 However, as we were once again backing out of our sheltered Jalón river pool [#1] after having drawn a blank, a lone male Common Darter finally appeared, hovered very briefly, then zoomed off not to be seen again. He was there, though. Burns Night. Well, Burns Day, anyway. A hazier day but still basically sunny and relatively calm. 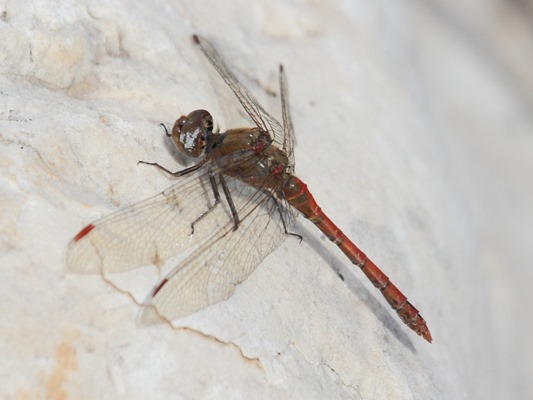 We found one lone male Common Darter in Jalón [#1] with, apparently, a problem with one of its eyes – looks a bit like the odonata equivalent of a cataract. After spending a long weekend with friends about 250kms north in Peñíscola, on our return journey we hopped off the autovia just south of Valencia to check out potential landscape line-ups in part of the albufera, specifically the rice paddies near Silla [#5]. Wandering along one section, Carol scared up a Common Darter. Landscape lenses didn’t help us get a picture but it was there. Almost February but not quite.